Venezuela’s self-declared president Juan Guaido, who twelve days ago declared himself “interim president” of Venezuela, claiming current President Nicolas Maduro is no longer fit to lead and that he essentially usurped power, said that he wants a "productive and mutually beneficial" relationship with China and is ready to engage Chinese officials in dialogues “as soon as possible”, even though China, along with Russian and Turkey, are among the handful of countries who have refused to recognize his self-proclaimed presidency to succeed Nicolas Maduro. In an interview with the South China Morning Post, Guaido extended an olive branch to China, which would continue to play a role in Venezuela’s economic development, adding that Beijing’s deals with Maduro’s government would remain in force so long as they were entered into in adherence to "due process." “China is a crucial global player, and we want to establish a productive and mutually beneficial relationship,” he said in an email interview. The 35-year-old leader of the opposition-controlled National Assembly added that “China’s support will be very important in boosting our country’s economy and future development." It will also be critical for the ongoing soft coup to succeed as without the support of China and Russian, a new administration in Caracas will find it next to impossible to find global recognition, if it is shunned by two of its biggest clients, and creditors. As we have reported previously, China along with Russia, has remained firm in supporting Maduro, even as international recognition of him as the legitimate Venezuelan ruler has fallen apart over the past week. Following what was effectively an oil blockade by US President Donald Trump last week when the US imposed sanctions on state-run energy company PDVSA, the European Parliament on Thursday recognized Guaido as de facto head of state, heightening international pressure on the socialist president. EU governments, divided over whether to recognize Guaido, also agreed to lead an international crisis group with South American nations to seek new elections, setting a 90-day time limit, and threatening further economic sanctions. Speaking to SCMP, Guadio said that “Maduro is increasingly isolated and is largely acting alone", even though China has clearly not isolated Maduro, adding that "China has witnessed at first hand the plundering of our state resources by Maduro’s government. Its development projects in Venezuela have been equally affected and falling due to governmental corruption and debt default." What he didn't say is that China is quite delighted with these events as it has allowed Venezuela to become what is effectively a debtor in possession into an insolvent state. China's foreign ministry spokesman, Geng Shuang, said on Friday that China’s deals with Venezuela should not be affected “no matter how circumstances change”. When asked at a press conference if Beijing had contacted Guaido, Geng said China has been in touch with “all sides” in different ways. China is one of the biggest creditors of the socialist Latin American state, having loaned $50 billion to Caracas over the last decade, which the South American nation has been repaying in oil shipments. Furthermore, during Maduro’s trip to Beijing in September, President Xi Jinping and other Chinese leaders promised to “provide whatever help it can offer” to cash-strapped Venezuela. 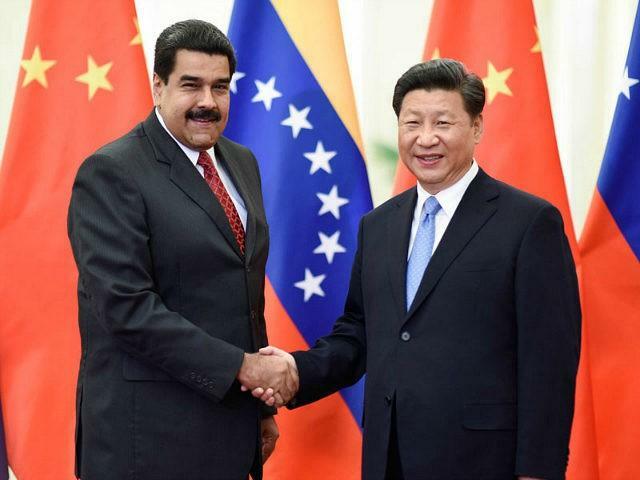 Maduro also secured multiple deals with China worth “billions of dollars”, including another US$5 billion credit line. So having his work cut out for him when it comes to dialog with Beijing, Guaido conceded that he would need its support too: “Venezuela needs to reactivate its international relations with different global actors based on a solid spirit of cooperation and the interests of our people,” he said. “Given its competitiveness and market, China is a fundamental global player with whom we would like to relaunch our relationship based on mutual respect and cooperation... We are ready to begin a constructive relationship and dialogue with China as soon as possible." It's unclear if Guadio's olive branch will have an impact on bilateral relations. Jiang Shixue, vice-president of the Chinese Association of Latin American Studies at the Chinese Academy of Social Sciences, said Beijing’s decision about who to recognize as president had nothing to do with commerce or geopolitics. Rough translation: China will back anyone that the US is against. But Maryhen Jimenez Morales, a politics lecturer at the University of Oxford and an expert on Venezuela, said it made perfect sense for China to switch its support to Guaido. “The political dimension of the crisis is also hurting the bilateral relationship [between China and Venezuela because] Maduro has basically no popular support any more,” Jimenez said. 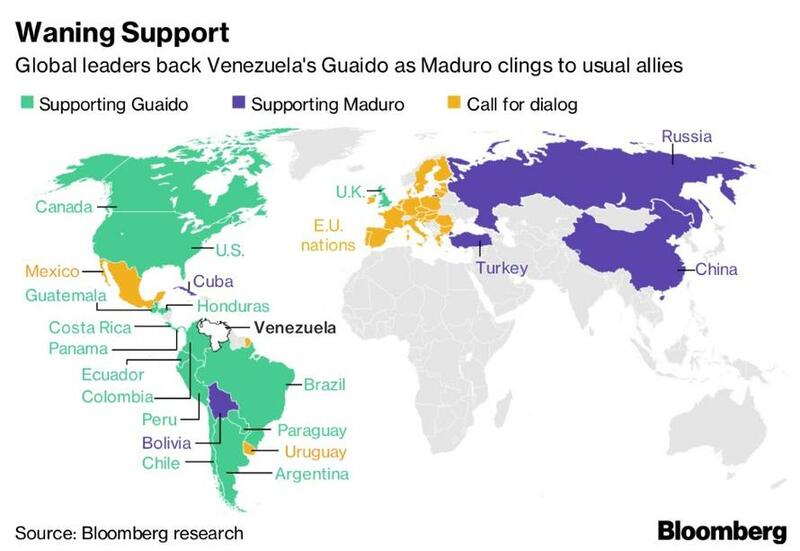 “Beijing has enough reasons to support Guaido’s presidency without [him] offering any additional economic benefits.” Recognizing Guaido was “a step forward to a more stable and trustworthy relationship”, she added. We doubt that will happen, especially when Trump continues to threaten to send the US army to Venezuela as he did on Sunday, when he signaled he’s confident a transition of power in Venezuela is under way with the U.S. pressing for Guaido to take over. Trump also added that the use of U.S. military force in Venezuela remains “an option” and he isn’t inclined to negotiate with President Nicolas Maduro to persuade him to leave, Trump said in an interview on CBS’s “Face the Nation” airing Sunday. At the same time, “I think the process is playing out” as Venezuelans take to the streets to protest, he said. “If you talk about democracy, it’s really democracy in action,” the U.S. president said, confirming that the soft coup is only taking place thanks to ongoing support from the US. Turkey confirmed as much on Sunday, when Ankara warned that the states refusing meaningful dialogue with the legitimate authorities of Venezuela - i.e. Maduro - only ‘help’ to plunge the country into more chaos and uncertainty, rather than contribute to resolving the problem. Turkey’s top diplomat quoted by RT, was speaking on Sunday before the election ultimatum, given to the government of Nicolas Maduro by several European countries, expires. In a bid to put more pressure on Nicholas Maduro, the UK, Spain, Germany, and France issued a blunt ultimatum, calling on him to announce new elections by the end of Sunday (February 3). If Maduro does not relent, they pledged to automatically recognize Guaido as the president of Venezuela. The ultimatum was slammed by Moscow, which pointed out the “identical” wording of the threat.